Teaching children the alphabet is foundational to learning how to read. Before children can put together sounds or draw together lines that make words, they need to know what they are. If you’ve never taught the alphabet before, the concept may sound abstract: how do you teach something that comes so naturally to you? Teaching letters can be really fun and simple. In this article, we’ll give you easy ways to teach the alphabet to preschoolers. Obviously, we all know the English-language, “A-B-C-D, E-F-G,” song. That’s a great place to start. However, there are more alphabet songs, which can add variety to your tunes, and help kids learn the alphabet in different ways. This article lists a whole bunch of alphabet songs to try. And, if you saw our article on YouTube channels for toddlers and preschoolers, you can find letter-related songs there too. The visuals in videos can show objects that start with each letter, and sometimes the songs also pronounce sounds too. 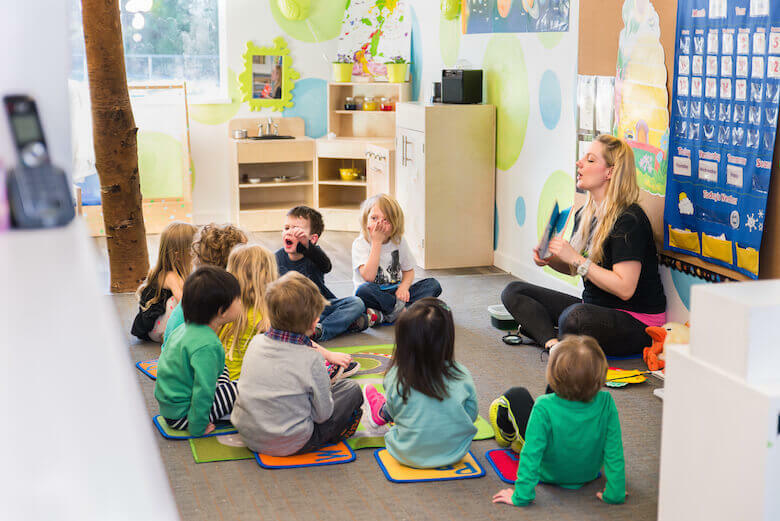 One important note brought up by this early childhood educator, is that kids should go from singing the song, to being able to say and point out the letters without a tune. So don’t stop at singing! Letter matching games are easy to set up. You can have a poster board with the alphabet printed on it in large letters. Have separate letter magnets or paper letters cut out at the same size as the print letters. Ask the preschoolers to match their cut outs to the letters on the chart. Where does “A” go? Place the letter “A” cut out on top of the printed “A” on the poster board. Get them to practice doing this with all the other letters. As the early childhood educator mentioned above noted, you can also have an alphabet ‘arc,’ where one end of a half-circle shows the letter “A”, and the other end the letter “Z”. In between you can have other letters in the alphabet shown, but not all of them. Ask the preschoolers to put down their block letters in the right sequence, using the pre-filled in letters as clues. You may have seen us post on Facebook that a certain week is brought to you by a letter we’re covering. It may be “C,” and you’ll see photos of us painting the letter C at daycare, or learning about animals that start with the letter “C.” Weekly letter themes are common in preschools. You can take your weekly letter curriculum a step further by creating a box that children can open to discover objects that relate to that letter. For example, on the week covering the letter “A,” your preschoolers can open (or even unlock) a box that contains an apple, a toy airplane, a toy alligator, an acorn, an arrow (a safe one! ), and so on. In fact, don’t tell the children right away what letter the box of ‘treasures’ represents. Ask them if they can guess the letter they’ll cover that week by observing the objects in the box alone. This can be a fun and whimsical way to have your children get excited about the week ahead, and work together to come up with an answer. Since repeating a letter over and over again can get boring, you can mix it up a little by bringing in related lessons. You can start with a week’s letter as your core subject. Then, throughout the day, teach interdisciplinary subjects that still relate. For example, if you are on the letter “R,” you can learn about the colour “red” too, since it starts with “R.” Ask the children, ‘what things are red?’ If you are on the letter “A,” you can learn about apples. We’ve done this before, where we teach children about the types of apples there are, as well as explain that seeds are inside an apple, and so on. Flashcards are a great memorization tool, and the alphabet is all about memorizing. However, this teacher warns that sometimes, pre-made flashcards can get really confusing. If you are teaching the letter “D” and there is an image of something that simply uses the sound of “D” somewhere in the word, but doesn’t start with “D”… well you can quickly see how even adults would be confused by that. Remember, at this stage, you’re not teaching phonetics or complex vocabulary and pronunciation. First, children need to recognize and know the alphabet. Use the simplest flash cards, with the simplest pictures of the objects and animals that preschoolers can recognize. That said, sometimes you want to use lowercase and uppercase letters in your flashcards…and yes, that can be confusing for the very young learners, especially when the upper and lowercase look so different, but are called the same thing. But if you’re using a set of magnets, for example, you can just use their uppercase versions, that’s ok (they may only come in that form). For very early learners, you can start really basic. Just don’t forget to start showing them the lowercase and uppercase letters together at some point in their alphabet learning journey. Speaking of interdisciplinary alphabet learning, why not do a baking session with the kids at preschool? They can use letter-shaped cookie cutters to make a fun and yummy snack. Meanwhile, there is a host of lessons you can teach with the baking activity. Chemistry, cooking, nutrition…the list goes on. If you want the easy route, try commercially-sold letter-shaped biscuits. IKEA has a version of these. Ask your toddler or preschooler to name the alphabet letter they’re about to eat. Eating it can be the reward for getting it right! And of course, there is alphabet soup, or noodles shaped like letters. You can make mealtime fun, and educational, with these edible alphabet manipulatives. So there you have it, 5 easy ways to teach the alphabet to preschoolers. They may even be fun for you, too! It is super cute to hear little ones pronounce letters, and guess what object goes with each letter. When your preschoolers are learning the alphabet, be sure to take every teachable opportunity you can to encourage them to recognize letters in the world around them. If you’re on a field trip, ask the children if they can spot their letter-of-the-week on a street or building sign. If you’re reading a book, see if they can spot the letters you’re reading to them. Keep pushing letter recognition throughout the day, so the lessons can really sink into their memory.